The Cloudlifter is an inline mic “pre-preamp.” It was designed by ribbon microphone expert Stephen Sank to give low-output dynamic microphones — especially including passive ribbon mics — 20dB boost of clean, transparent gain. It is essentially the “active electronics” section of Stephen’s new JRS-34 ribbon microphone. The Cloudlifter pairs two of these amplifier circuits into a bulletproof steel box, providing two independent channels of portable gain. Passive ribbon mics typically have relatively low output, and need lots of preamp gain (or really loud sources) to produce comfortable signal levels. For example, the Royer R-121 has a sensitivity rating of 3.9 mV/Pa. The Crowley & Tripp Naked Eye, aka Shure KSM313, is rated the same as the SM-57 — about 1.9 mV/Pa. In contrast, most modern condenser mics are rated above 10mV/Pa — for example, the average sensitivity of all the MXL mics we’ve cataloged in the microphone database is 18.6 mV/Pa. I’d wager that everyone who has used a passive ribbon mic on an acoustic instrument or voice has wished for more gain. Cranking the gain on a preamp up to its highest setting is not usually a good idea on inexpensive pre’s, which in my experience pack a lot of noise in the top quarter of the gain pot. 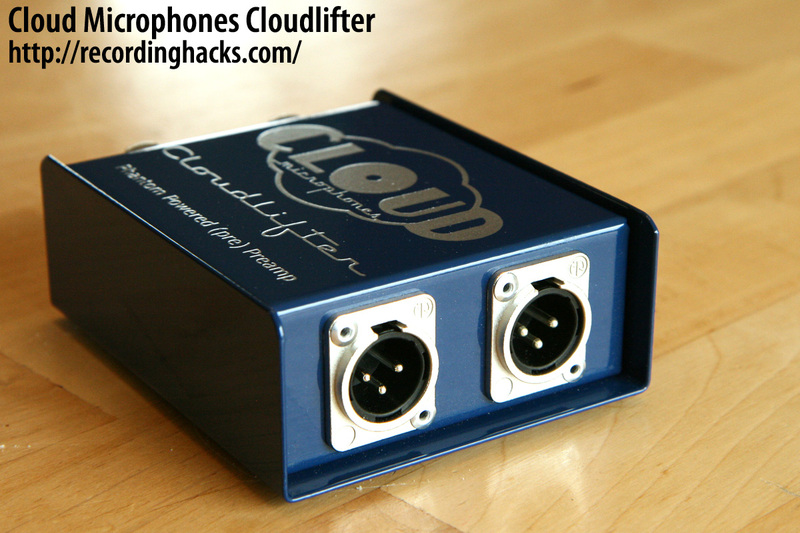 The Cloudlifter seems like an ideal solution to underpowered, noisy preamps. 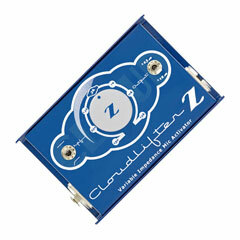 The Cloudlifter is a heavy (1 lb./450g) steel box measuring 4.5 x 3.75 x 1.75 inches (115 x 95 x 45mm). Two Neutrik XLR-3F input jacks are riveted onto the left side of the device. Two Neutrik XLR-3M output jacks are riveted onto the right. The top input and output provide one channel of gain; the bottom pair of jacks provide a second channel. There are no buttons or switches on the device. In the hand, the Cloudlifter feels very solid. It seems capable of taking abuse (or causing it, if you throw it at someone). I can imagine these things outliving their owners. The only thing I don’t like about the physical packaging is the four panhead screws protruding from the bottom of the case. Be sure to install the rubber feet that ship with the device, or the screwheads will scratch the surface of whatever the Cloudlifter sits on. 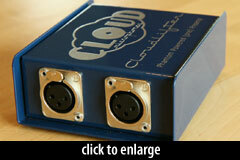 Designer Stephen Sank claims that the Cloudlifter will produce 18–20dB of gain. Cloud Microphones, having completed additional testing since this review was initially published, says that 20.5dB is the minimum amount of gain a user could expect from the Cloudlifter. Sank says further that the Cloudlifter will isolate the microphone(s) from frequency-response changes that might result from variances in preamp input impedance. I designed the Cloudlifter with a 3000Ω input load resistor. This will load pretty much any ribbon or dynamic mic to a low-enough impedance to make the mic’s output transformer happy (i.e., give its expected frequency response), whether an old RCA or a modern Chinese microphone. 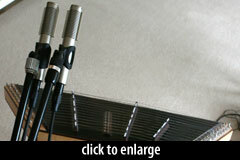 According to Sank, the 3kOhm resistive input load is ideal for most passive ribbon microphones. Mics plugged into the Cloudlifter will see this 3kOhm load, regardless of the downstream preamp’s input impedance. A side-effect of this design is that if your preamp offers variable input impedance — the point of which is to color (or, arguably, to uncolor) the sound of the microphone — then the Cloudlifter will essentially disable this feature. A second notable feature of the Cloudlifter circuit is the lack of capacitors and resistors in the signal path. The Cloudlifter is entirely direct coupled. Undersized, low-grade capacitors can be a source of unwanted sonic coloration (which is why the first step of nearly every Chinese mic mod is to upgrade the coupling capacitor). The Cloudlifter bypasses this risk entirely. 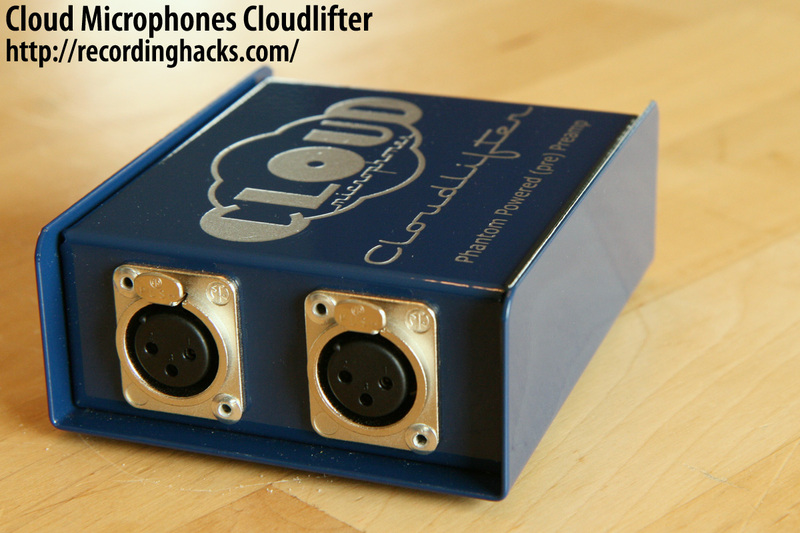 Plug a mic cable into one side, and run a second cable from the Cloudlifter’s output into your preamp. Enable phantom power for that channel of the preamp. No further configuration is necessary. Just plug and play. First, and obviously, to raise the signal level of a quiet acoustic instrument above the noise floor of the signal chain. Secondly, the Cloudlifter can be used to reduce the amount of preamp gain needed to achieve any desired signal level, even for loud sources; this is an effective way to hear less of a preamp that doesn’t sound good for a particular application. Third, for providing a passive ribbon mic with an appropriate impedance load regardless of the input impedance of downstream preamps. Fourth, as mentioned, the Cloudlifter prevents potential ribbon damage due to phantom power. There is one thing to be cautious of when using the Cloudlifter. I tended to keep it near my DAW, with a short output cable and a long input cable. That configuration is problematic. It will work fine in many cases, but during one test I heard a hum through the Cloudlifter. It wasn’t a bad cable, bad preamp channel, or bad mic. I swapped everything, and moved all the power cables around. The final resolution? I set the Cloudlifter at the base of the mic stand, with a short (2m) high-quality (Mogami) XLR cable to the ribbon microphone. Minimizing the cable run for the unamplified signal made the noise go away. This recommendation will be made clear in the product’s User Guide, according to Cloud Microphones. Test 1: What does the Cloudlifter sound like? I put up two TnC ACM-3 ribbon mics side-by-side, above and in front of the soundboard of a hammer dulcimer. I plugged both into a Presonus Digimax FS preamp. One of the two mics had the Cloudlifter inline, so I adjusted the gain pot for that mic on the DigiMax until Pro Tools registered equal gain from both mics. I recorded a short passage, then swapped the Cloudlifter to the other mic, reset gain levels, and repeated the test. To be fair, these tests are terribly flawed. The two mics are in slightly different positions. The ribbon tensions (stock Chinese-factory installations) are probably not exactly equal. The mics have different output transformers. So, in the sense that I was trying to prove that the Cloudlifter creates “transparent” or “neutral” gain, this test basically fails, because by all rights each pair of samples should sound different. But, after close listening, it’s clear to me that the Cloudlifter sounds at least as good as my own preamps. Listen for noise within the tail end of each sample… there is not enough there to worry about, on any of these tracks. Next, I set up a single mic — in this case, an ACM-2 whose ribbon and transformer had been upgraded by Stephen Sank. 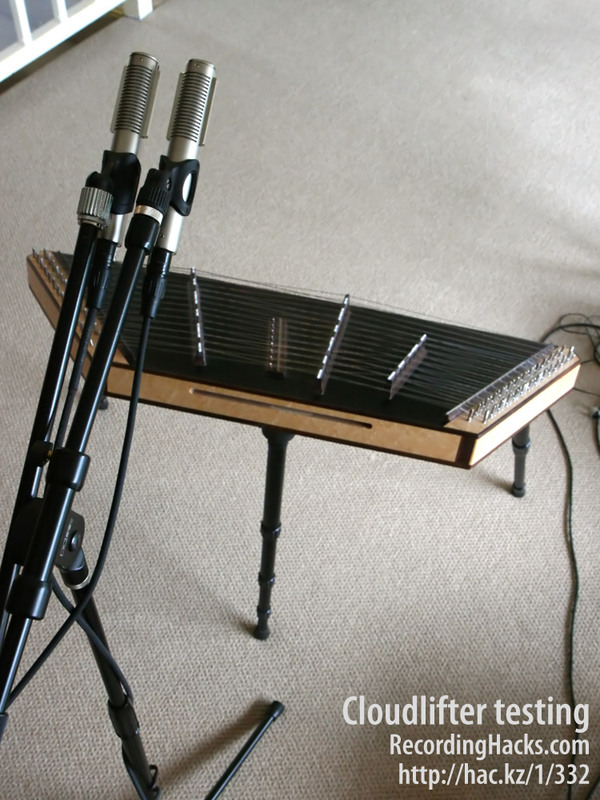 I recorded a short melody on the hammer dulcimer, with and without the Cloudlifter. Therefore the following two performances are different. The gain of the recorded tracks was within 1/2 dB of equal — which of course means that one track has about 24dB less preamp gain. For the samples below, I boosted the quieter track slightly in Pro Tools so that the level of the peaks would match. I don’t hear any frequency-response difference that might accompany the change in input impedance, but I do hear a higher noise floor in the track without the Cloudlifter. Listen to the “silence” before the first note; the non-Cloudlifter track is 8-10dB louder! Which is which? In each of the above three pairs of tracks, the Cloudlifter sample is first. Test 2: How much gain does the Cloudlifter generate? 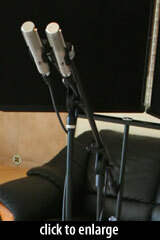 To test the device’s gain, recorded a 1kHz test tone with a passive ribbon mic, with and without the Cloudlifter inline. The preamp gain pot was fixed for both takes. I then measured the level difference between the two digital audio tracks. The difference in gain is not large (< 2dB), but it suggests that 20dB is the least you could expect to see. Test 3: Why can’t I just record at low levels and then crank up the gain digitally in my DAW? I put together an audio demonstration of why this is a bad idea, even in a 24-bit session. In short, the Cloudlifter amplifies the signal from the mic, whereas adjusting digital gain in the DAW will “amplify” the noise floor of the entire input signal chain. For this test, I recorded ambient noise from my office, with and without the Cloudlifter. Preamp gain (again on the Digimax FS) was the same for both takes; the pot was at about 2 o’clock. I then used Pro Tools to add 23dB of makeup gain to the non-Cloudlifter take. The Cloudlifter is not the first inline preamp; Rode’s D-Power Plug, Triton’s Fethead, and Sanken’s HAD 48 are functionally similar. The only online references I can find to the Rode unit are from people reporting secondhand that they’ve heard that the D-Power Plug is really noisy. I could not find a single recommendation. I couldn’t find any useful discussion of the HAD 48 either. The Fethead fares better; our friend and associate Michael Joly has had good results with it. I considered arranging a shootout between the Cloudlifter and Fethead, but quickly decided that trying to measure which inline preamp is more transparent sounding would be about as much fun as finishing my 2009 income taxes. Gain depends on input impedance of downstream preamp. As of April, 2011, Cloud began offering a non-transferable lifetime warranty on the Cloudlifter, with product registration. [3000Ω] is a range much more friendly to the vast majority of ribbon mic transformers than [is] a 22k load. So, [the Cloudlifter will have a] more even response from at least 90% of ribbons, and 99% of classic ribbon mics. As in all things audio, opinions vary. I received this response from Triton Audio about the Fethead’s high input impedance. The 22k input impedance was decided after extensive listening; it gives dynamic and ribbon microphones a more open character. I listened to the Cloudlifter on quiet acoustic instruments and on my own voice. I tested it with three different ribbon mics and two different mid-fi preamps. In all cases, the Cloudlifter gave me a ton of gain and no problems with noise. It sounds cleaner than both my preamps. The Cloudlifter is a winner. It solves problems some ribbon-mic owners don’t even know they have. It does exactly what it claims to do, and does so well. The box is smartly designed and will last forever. I think it’s a must-have for anyone who records quiet sources with ribbon mics. I have no affiliation with Cloud Microphones, and received no compensation for this review. The Cloudlifter was loaned to me for review purposes, but unfortunately I have to send it back. so, i can pay $300 for a passive lifter, or half that for an M-Audio DMP-3, which is basically a wire with gain but a LOT more features, and is beloved by golden ears types? Bob, that’s a valid question. I think the easiest answer is “all gain is not created equal.” The Cloudlifter sounds better than than my Digimax FS (~$75/channel preamp) and my modded Digi-002 Rack on quiet sources. The DMP-3 has a great reputation and may indeed sound better, but the high end of its “high gain” range is where you’d be using it for ribbon mics on quiet sources, and that’s probably not its sweet spot. Note too that the P48 switch on the DMP-3 activates both channels at once, which means that if you’re using the DMP-3 with a condenser mic, you can NOT simultaneously use it for a ribbon mic in the second channel… unless you use a Cloudlifter or Fethead too. Dickie, the average human — minus the restorative dental work and smartphone — has about $0.49 worth of “parts” in it. Nonetheless, there’s nobody here who could take the requisite amounts of oxygen, carbon, and hydrogen and combine them to produce anything other than maybe a really loud bang. Snarkiness aside, my point is that the design of the circuits is proprietary, and the selection of components required months of prototyping. The specific combination is greater than the sum of the inexpensive parts. Cloud and Triton could opt to give all that away in kit form. But the DIY market is significantly smaller than the regular retail market, so the idea that the manufacturers could sell more volume of a lower-priced kit is, in my opinion, fallacious. Unfortunately. Sounds like a nice adder. Saw it in Frankfurt and mechanically a rock solid device. Has anyone testet the box direct on a ribbon, without transformer in between? Wonder how it compares to using a dedicated Ribbon mic pre like the AEA TRP or the True Systems P Solo Ribbon? Angus, I’ve been impressed by the True Systems pre’s I’ve heard. But I think these products have different intentions — and significant cost differences. A dedicated ribbon-mic preamp will set you back over $500 (for the True Systems unit). 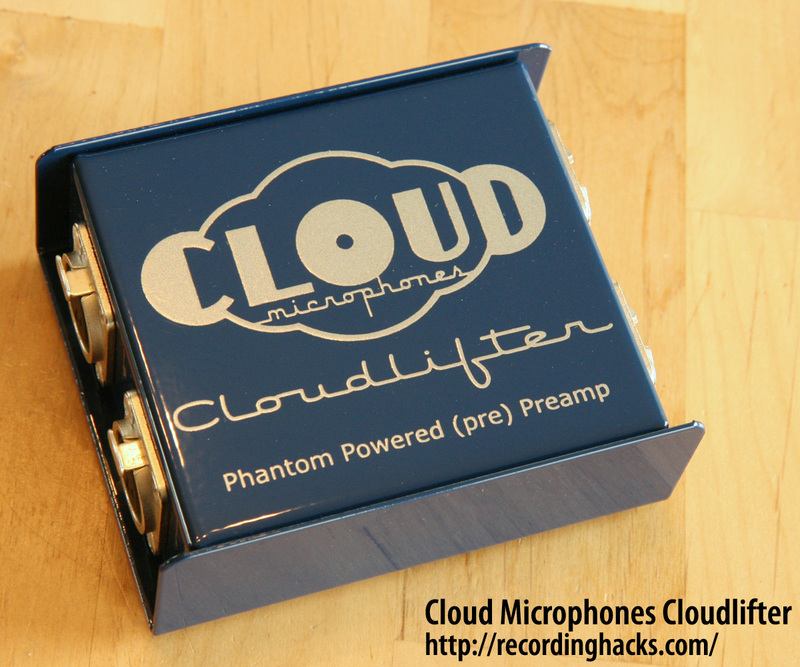 In contrast, for ~$290 the Cloudlifter lets you use _two_ ribbon mics with any pair of channels in your DAW. Both solutions will sound great. But if your DAW has marginal preamps, then the True and AEA pre’s will probably sound better. Keep in mind, too, that the True and AEA pre’s are analog only, so you’ll still need to use DAW inputs. External analog pre’s don’t really add input channels, just “color” choices for the existing channels. I don’t fully under stand mic impedance (output?) matching with pre impedance (input)–does this apply to pre-preamps? I can’t find the impedance of my Vin Jet ribbon mic, so I’m not sure how it matches with the Cloudlifter pre-pre–I found in other sources that the rule of thumb is the pre impedance should be 10x that of the mic’s impedance for best recording results. What’s your take on this? Also, is there a need to match the impedance of the Cloudlifter (or Fethead) pre-pre’s with the impedance of my DAW’s pre’s? Thanks! I found your analysis most interesting and as usual, very useful to those of us seeking a practical solution for using even “restored” ribbons, such as the B&O BM-3 and pair of BM-4’s I happen to own. Even when used with an Aphex 1100 mic pre on chamber music, there was insufficient gain to get above a sheen of hiss. That completely obviated the use of those microphones in that application. Now, if I were to try using a CloudLifter, I wonder how things might improve? 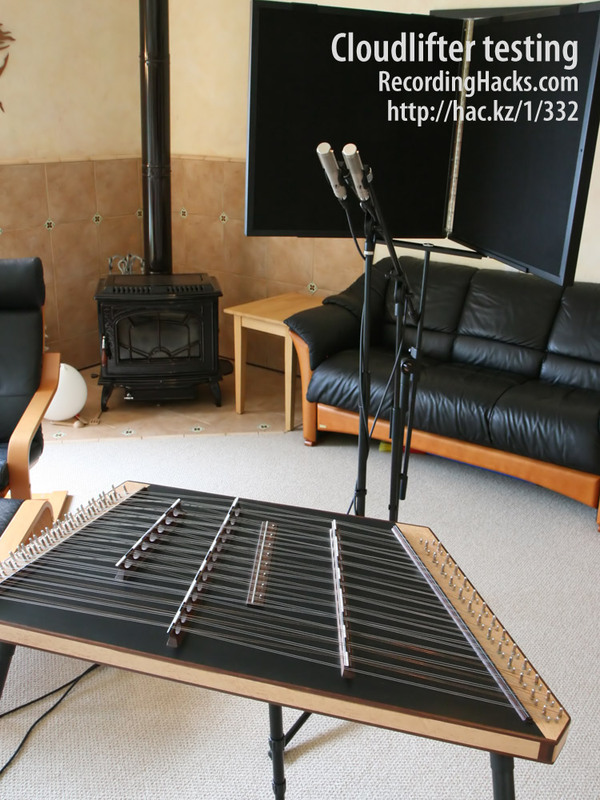 If this device does what I expect, that is, lower the level of hiss, then we are on first base for recording applications, since I’d love to record solo piano as well as trios and quartets with what I already own. Richard, I’m not familiar with the Aphex 1100, but there’s a decent chance the Cloudlifter will help — because it will let you run the 1100 less hard. In my experience, the highest gain range of most preamps is the noisiest gain they offer. But you might also have your mics looked at. If their output level is too low, and you’re recording a quiet source, you certainly invite preamp noise. Ribbon gain is affected by the magnets, the output transformer, preamp input impedance, and probably by ribbon tension. Depending on how “restored” your ribbons are, you might want to have a reputable ribbon expert investigate the possibility of raising the gain of those mics. Thank you for the very helpful review and discussion on the use of the cloudlifter with ribbons mics. I just recalled the “Really Nice Preamp” and read this review. Do you think the FMR RNP could be a comparably good alternative for a ribbon such as the AEA R84? Taimur, I’ve only ever read good things about the RNP. I own and enjoy a pair of RNCs, and I’m inclined to expect good things from the preamp. The RNP and Cloudlifter are not equivalent products. 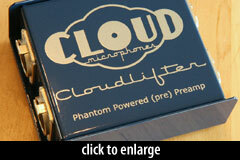 See the review’s comment that the Cloudlifter is a “pre-preamp.” You still need a mic pre to plug the Cloudlifter in to. The challenge for the RNC, and every preamp, is producing clean amplification at the top of the gain range. If you read the RNP manual, you’ll see the designer’s comment “I decided that the sonic character … and a decent price point were more important than the absolute noise floor.” Producing super-clean amplification at +66dB was not the design intent of this preamp. If you’re miking a guitar amp (or any loud source), preamp gain is not so critical, because even a passive ribbon will produce a decent signal. But if you want to record a quiet acoustic source, especially at a distance, you’d be better served by adding a Cloudlifter to the RNP. Thanks a lot, Matthew. Actually, I have a pair of GA R1 MK3 Active ribbons which I really like for my sarangi, and I wanted to get an AEA R84 and know how I could use it best. Now, it is very clear to me. I’m thinking this will probably be a good addition for a Shure SM7B as well? I had the Grace 101 but wanted another option (I sorta couldn’t justify the cost of the preamp alone). The SM7B also has a low output and I’d love to connect it to my Yamaha GO46 interface. Boris – yes, the Cloudlifter is an excellent mate to any dynamic mic, whether ribbon or moving-coil. I went ahead and ordered a CL-1. Talked to Rodger at Cloud and he was very helpful. Hopefully I’ll have it here next week! @Boris I record with a cloudlifter and an SM7 B with EXCELLENT results. Pick one up! I just ordered the Cloudlifter today based upon my experience this past week with my first ribbon mic (MXL R144) and my FMR RNP. It sounds like this little jammy will do the trick! My understanding from this is that the cloudlifter is a pre-preamp. If I run my Fathead ribbons into my DMP3 with twenty or thirty db of clean gain, and then into the XLR (mic) input of my Focusrite octopre DAW input, don’t I get the same thing? It seems that if I have a channel of a really good preamp with a 2k or above input impedance in front of any good DAW preamp, I’ll get the same result. Am I missing something? Also, two channels of DMP3 are less cost than the cloudlifter and have a decent lowcut filter. The first thing to note here is that you may need to pad the signal going into the second preamp (which may defeat the purpose), or risk possible damage to the secondary input. Assuming that the secondary preamp’s input does not get smoked, the signal would still be subject to the noise floor of the initial preamp. Additional noise and signal degradation could occur due to the large number of extra components in the signal path, and there would certainly, at minimum, be a great deal more coloration with this type of setup. Coloration is fine, as long as you like the color, but please proceed with caution. On the other hand, the Cloudlifter was designed for this task, uniquely providing 2 distinct gain stages, using 4 carefully hand-matched JFETs, without the use of additional components in the direct audio path that could impact the sound. This makes for super-clean gain. The output of the CL is friendly to any input with phantom and is similar to the type of signal you would expect to see from a high-quality condenser microphone, but with the wonderful tone of a ribbon or dynamic. Also worth mentioning, the single channel version (CL-1) is now available, and the price of the Cloudlifter CL-2 has come down since this was originally published. I understand that going into the 2nd preamp’s mic input would cause an impedance mismatch and probably increased noise while also risking damage to it, but many preamps provide line inputs for this purpose. How does the Cloudlifter or FEThead differ from this configuration? Regarding the updates I’ve made to the CloudLifter circuitry, I want to add here that, OF COURSE, any owner of an early 2-channel CL unit that is having any RF or other noise issues is quite emphatically encouraged to send the unit/units back to Cloud Microphones or even directly to me(address on my site, stephensank.com) for FREE update to the current circuit configuration. We only ask that you pay shipping to us, and we will pay shipping back to you. At this point, we have tested the current CL units in the worst environments & with the most interference-sensitive mics(plastic body Beyer M320 being a great one for that), and I do feel that I’ve made the CL circuit as immune to environmental interference as any low level audio device can be made to be. Even the earliest CloudLifter units do have RF suppression. It just wasn’t “aggressive” enough for the worst case mics & environments. It inevitably takes time to find out just how much worse user conditions can be than what a designer like me originally anticipates. Great dialog here and I may have stumbled on to a solution for my frustrating setup. First, I have the Shure SM7B and have it going in to an ART ProChannel. In order to get any decent gain going in to my M-Audio interface I have to really crank up the gain and the 20db boost-which results in a lot of noise. My question is this: Would the Cloudlifter help my signal chain by not having to push the channel strip so much? My other option is to step up to the plate and upgrade the channel strip. By the way, I use this setup for voice over’s in producing radio commercials in our market, so I’m searching for ways to improve the final product. Thanks in advance for any advice you can provide! 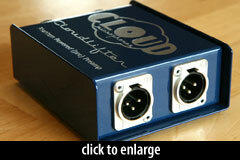 @Curt, the cloudlifter would absolutely improve your tracks. The SM7B is a great mic, but infamous for its low output level. Run it into a CL-1 or CL-2 and then into your channel strip, and you’ll be able to run the preamp at a moderate level and still have plenty of signal. Upgrading the channel strip is another option, but would cost significantly more. Thank you for the tests!!! Listening to the .wav files you can hear the enhancement the Cloudlifter does to the ribbon sound captured. I don’t know which part is due to the input Impedance change from the Digimax FS’s 1600 Ohm to the Cloudlifter’s 3000 Ohm, vs. which part is due to the preamplification of the signal (20dB from Digimax FS vs. 20dB from the Cloudlifter) or which part is due to the better signal/electricity transportation through the mic cable/wire because the signal travels at 48V with the Cloudlifter vs. signal traveling at the low voltage output of a passive ribbon mic without the Cloudlifter but to me the sound is much clearer with the Cloudlifter in the circuit (more definition/sparkle/punch on the whole spectrum though it’s more apparent in higher frequencies) and the sound is richer/more-lush with the Cloudlifter (without the Cloudlifter it sounds a bit like a low resolution digital recording, a bit jagged/hashed/thin compared to the smoothness and fullness of the sound you can hear with the Cloudlifter in the .wav files, kind of like recording on a cheap condensor mic vs. recording on a great tube mic). I first checked this product for protection of a ribbon mic vs. 48V but I discovered the sound advantage it gives you too, which is by itself an amazing feat! Thank you for putting it out there by reviewing it! So let me get this straight. I could plug my Royer 121 into the cloudlifter then into my Avalon 737, leaving the phantom power on and everything would be ok? I could also just plug it directly into my DAW and skip the Avalon, right? If that is the case, I want one right now. Allen – yes, exactly. The Cloudlifter turns phantom power into ~20dB of gain, and then you get all the Avalon’s gain too. Thanks Matt – I’m ordering one tomorrow. I look forward to using the 121 more. I like the sound but usually choose another mic because the gain + noise is an issue. I have both the Cloudlifter and 2 Rode D-Power Plugs. On some ribbon mics, the Rode sounds better. On some, the Cloudlifter sounds better. It depends on how happy the mic is with the input impedence match. Both, however, get the signal cleanly boosted before the preamp and protect the ribbon from phantom power. Hello; most of this discussion seems to focus on balanced ribbion mics. On a slightly different topic: I use lots of vintage dynamic mics (Shure, Turner, American, Universal, EV) from the 1930s through ’50s, with lots of different connectors and impedances. My question involves Hi Z vs. Lo Z (usually < 50 ohm); and balanced vs. unbalanced mics. Will the Cloudlifter be suitable for all of these mics regardless of their output impedance? And how should they be wired? In other words, should a mic with a single-conductor button connector be terminated on the other end with an XLR with pins 1&3 shorted together or left open? Or is an unbalanced mic even an option here? I own two of the Cloudlifters (CL-1) and I just wanted to mention that they sound just as good as every good review says (. . and even better, once you realize that a mic you would have NEVER used for acoustic guitar or vocals is now a real contender with condensers.). I do see these as very sturdy, mini- mic preamps. Cool blue color too. As this is a ‘old’ review, I was wondering if there was new contenders, better priced maybe?. Good DIY options maybe? What I need is a device like these, with it’s own power, so I could get a clean boost that equals “Line level”, in order to use my old Electrocompaniet Hifi ampifier as a premamp. I don’t find the Cloudlifter price to be too high for the value provided. $149 for a single channel? That’s cheap. If I were to make a DIY version it would probably cost $149 for the kit.